Frequent morning headaches are more than just a sign that you are not getting a good night’s rest. They are also a sign that you should visit your dentist. Many people who suffer from recurring headaches in the morning, soreness in the face – especially in the jaw area, or tension in the neck or shoulders are often suffering from Temporomandibular Disorder (TMD). Gold Hill Dentistry specializes in effective treatment for TMD. We are a comprehensive dental practice that treats patients of all ages in a gentle, caring, and relaxing manner. Dr. Kavi Sagunarthy and Dr. Jennifer Mokris are both highly trained in treating TMD and helping patients find long term relief from their painful symptoms. The most common causes of TMD are grinding the teeth at night, clenching the jaw during the day, and a misaligned bite. All three of these factors put an extreme amount of pressure on the temporomandibular joint, causing radiating pain to be felt throughout the facial region, neck, and shoulders. Many times when you go to the doctor with pain in the neck or shoulders, they do not associate the pain with TMD. However, as dentists we understand the connection and how TMD can cause referred pain to other areas. 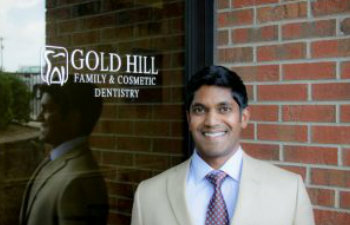 If you are looking for a dentist who can provide effective and long term relief from TMD, Gold Hill Family & Cosmetic Dentistry in Fort Mill is the dental practice you can trust. We have many options to treat TMD, and we carefully select which option is right for you based on your personal needs. Contact Gold Hill Dentistry today to schedule an appointment. We are currently accepting new patients, and we would warmly welcome the opportunity to serve you and your family. Our goal is simple: to help you achieve a healthy, attractive, and long lasting smile.